With January coming to a close, it’s time to make sure you are on the right track in the new year. Motivated by personal goals and new year’s resolutions, many of us use January as an opportunity to get our finances in order, set saving goals, start investing, paying down debt and more. Some of us even learn how to make and live by a budget for the first time in our lives. A month into the new year, now is the time to get started on those goals and resolutions or kick it up a notch if we’ve begun to let our progress stagnate. While we are all still trying to get over the holiday hangover, there’s no excuse for not working on your finances. In between visits to the gym, why not sit down and game plan what you’ll do with your money in 2015? It’s an easy exercise that can produce great results. Besides wanting to lose weight, many people also want to save more money each and every year, yet they rarely ever do. One possible reason is they forget to actually put money into savings. It’s great to want to save, but until you actually do it, the concept will get you nowhere. Luckily, it’s super easy to create an automated savings plan, which will transfer money into your savings account on a specified date. This way, you don’t have to worry about forgetting to save for your future. If you don’t like the automated method, then you can treat your savings like a monthly bill such as I do. I pay myself every month on a specified day. If I don’t make the payment to my savings account, then I pay my account interest. Yes, it’s a penalty, but it’s only making my savings account bigger. No complaints there. If you don’t have an IRA, then it might be time to open one up! You can open an IRA before the tax deadline and fund it to count for the previous year. If you have a traditional IRA, then you can lower your taxable income with your contributions. Depending on your tax profile and income, you need to look at opening either a Traditional or Roth IRA. Just do it before taxes are due! If you’re looking for someone to invest with, make sure to check out John’s online brokerage page to find the one that best fits your needs. Debt is like weight loss.It takes time and dedication to get it paid off. There is no better time than January to focus on how you will start or continue paying your debts. Focus on creating a plan that lets you tackle all your debt. We talked about using the debt snowball and the debt avalanche here last week as potential options. Remember, no way is better than the other. Each one has it’s strengths and weaknesses. Which one you use isn’t as important as just picking one. Make a serious effort this month to start paying down your debt! This is a concept we explored over on my blog. People want to save money and stop spending so much, but they rarely challenge their expenses. I know I used to just accept what I paid and then moved on to other things. It wasn’t until I was in my debt repayment period when I realized I should challenge what I was paying. The great thing about challenging expenses is that there are tools out there, like Personal Capital, to help you do it. They and others like them help you catalog, track and analyze your spending habits and investments so you can make wiser decisions with your money. Once you know what you’re spending you can look for ways to cut your expenses, which can often come from a willingness to always be looking for a lower price. I negotiate and locate better deals on a regular basis. Why pay full price when you can use competition to find a better one? I have lowered my overall expenses by nearly 40 percent this way. Who doesn’t want to make more money in the new year? I know I do, so I’m constantly on the lookout for money making ideas that come my way. 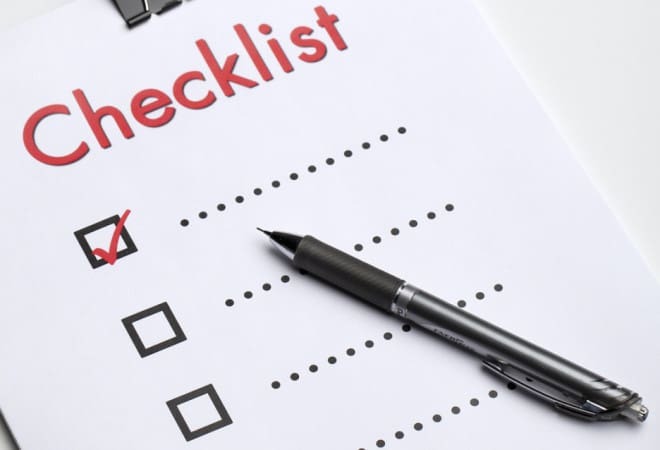 While some of these items on the checklist could take some time, like challenging every expense and making more money, the others are easy to do and you can complete before the end of the month. Remember, this is the perfect time to change your financial situation and get on the right track. Don’t wait for February, make the change now! What would you add to this checklist? Remember, this is not an exhaustive list. What are your financial goals for the year? How are you doing on your new year’s resolutions? Have you made progress or are you still hung over from the holidays? We maxed out retirement in 2014-yay! Well, I’m waiting until we do our taxes to top off my SEP IRA, but still. These is a great checklist. We just started an IRA and got better life insurance. I’d add considering an increase in charitable giving. I just don’t want this wealth thing to be all about us. Also on my checklist is reading more books about a philosophy of managing wealth. So far, 2015 is off to a great start goal wise. We are making good progress on everything. We’ve already maxed out our IRAs for the year because we save money each month just for them. Once we know our income, then we invest in the Roth (or do a backdoor conversion!). I am waiting for the appointment with the accountant when it comes to my solo 401k plan. I have been putting money in all year, but want to see what the max is I can save and then I will add to that account as well. I think that’s a great check list. If I added anything, I’d say use January to do all those things you don’t enjoy, like getting life or disability insurance or planning/updating your will. January is already a gloomy month, so you might as well get those out of the way. Great checklist, Grayson. I find that I get complacent with my bills too, so it’s a good reminder to challenge expenses and see if you can’t find a better price because often times you can. And I love seeing earning more money on the list. So many people just focus on reducing expenses, which is important, but ultimately earning more is what helps you gain the most traction. I’m adding “making more money” to the checklist, because that NEEDS to happen this year! I’m not sure why, but I don’t like auto-pay (or auto-transfers to my savings accounts). I guess I like the flexibility and control of making the transfer myself. I do make a transfer to my savings every month, but I can schedule it around what my cashflow looks like this way. I love this list. The final one is something that I am focusing on this year. Looking for different ways to make money will allow me to pay off more debt and start investing more. While these are all top notch, I really like the “challenge all expenses” idea. Not everyone does this. But sometimes changing the way you are doing something is the key to success. My goals this year are all around making more money and for me at this point it requires raising more money to help my business grow. I am excited about the process, but it is definitely scary at the same time. Good thing I am not afraid to do things that frighten me in order to grow. I can’t believe it’s almost February already! I didn’t make resolutions but did make 30 day commitments for the month of January. So far, so good. Now I just need to decide if I want to keep them for February or move on to something else. One new goal for February will be to work a little harder on the side hustle.